I was the only flat-chested model among the group of fellow survivors of all types of cancers, as well as loved ones modeling in tribute to loved ones who succumbed to the disease. You know the line, “Don’t get even, get even better?” I have, and I did! After I graduated college way back in 1980, during the nation’s worse recession, I could not find a job in the advertising biz as I had hoped, so I worked instead in custom drapery and furniture sales at a high-end department store in Burlington, Vermont, waiting for my big break. One January day, there was a flurry of excitement in the lunch room to match the flurry of snow outside. The store management announced that they were auditioning store personnel – women and men – for a spectacular, first-of-its-kind spring fashion show they were staging in late February at the Flynn Center for the Performing Arts just down the street – a fabulous, Art Deco vaudeville theater and movie house built in 1930 and recently renovated and restored to its original grandeur. At 5’5” and 118 pounds, not to mention a boatload of confidence and charisma to go with my knockout bod, I knew I would be a shoe-in. Only, I wasn’t. I stunk at modeling. My runway strut looked like Frankenstein with hemorrhoids. I was laughed off the stage. Thankfully, I soon landed a job in advertising and quietly exited the back door of the department store – and any illusions of a modelling career. But 40 years and 40-plus pounds later – and those once perky 38 Ds surgically removed to save my life from breast cancer – I was invited to try my luck again at the 5th Annual Seeds of Hope Fashion Fundraiser for Dartmouth-Hitchcock’s Norris Cotton Cancer Center here in New Hampshire, where I previously participated in an extended, five-year aromatase inhibitor drug trial. I was the only flat-chested model among the group of fellow survivors of all types of cancers, as well as loved ones modeling in tribute to loved ones who succumbed to the disease. This was no amateur hour. We’re talking committed area retailers and cutting-edge, independent fashion designers loaning Seeds of Hope models their finest inventory. It meant numerous fitting appointments and rehearsals and, on the big night, a production company with staging and lighting; full-blown make-up and hair styling with an entire crew of beauty professionals; a floor manager; and photographers. And then it was my turn. All the shame of 1980 (and all the pain of 2003 and 2012) were transformed into a state of mind somewhere between Nirvana and ecstasy. I walked that catwalk liked I owned it, and when I did the half turn on my walk back? I said in a strong voice so everyone could hear, “Ladies and gentlemen, I am flat and happy, and have never felt more beautiful in my life,” to which I received a standing ovation. Yeah, I rocked the crowd. And what a crowd it was. 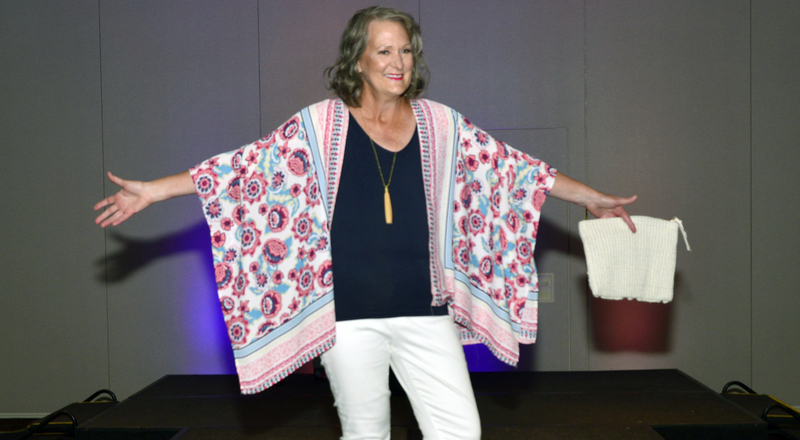 There were hundreds of family and friends and local fashionistas “ooh-ing” and “ahh-ing” over the fabulous threads and silent auction items whose financial contributions have amounted to over $100,000 for cancer research and patient services. According to Jean Brown, Executive Director of the Friends of Norris Cotton Cancer Center at Dartmouth-Hitchcock Medical Center, one of the more unique aspects of the Seeds of Hope Fashion Show fundraiser – and others within the Friends purview – are the seed grants between $10K and $50K given to young cancer researchers at Norris Cotton Cancer Center. Unable to apply for larger federal research grants without the needed data to support their hypotheses, such seed grants enable a new generation of cancer researchers to hire lab assistants, purchase materials and, most importantly, compile needed data. “We at the Friends are exceedingly proud to note that, over the last 10 years of providing seed grants, a $23 value in cancer research is returned for every dollar invested,” Brown told me. Additionally, and close to my heart, funds from the fashion show are used for patient services. While gas and grocery gift cards have long been an essential need for those cancer patients struggling financially to make ends meet when receiving chemotherapy, additional services such as art programs and massage therapy are now available to all cancer patients thanks to monies raised by the Friends. To date, Brown said that 1,200 massages have soothed aching, stressed bodies on infusion day. Seeds of Hope – it’s given so many just that, including me, hope and a sense of belonging as I navigate life without breasts.